It was almost as cold as Monday night had been but the home fans were warmed up by the Stan achieving 3 wins in 5 days. It was Crook Town’s first visit to Grounsell Park since the 1951-52 season when they won 5-1 in the Northern League. There were 4 changes to the Stan team from the match 2 nights earlier. The Stan started on the attack against a weakened Crook team and had a corner in the 2nd minute. Another corner 3 minutes later led to a McCabe shot which was cleared off the line and the Stan also shot over after 10 minutes. 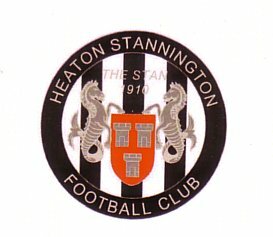 The Stan were dominating and should have scored in 16 minutes when Hayton sent the ball into Philipson whose driving header at the back post was palmed away by Sinclair in the Crook goal. After 20 minutes Sinclair cleared a low shot from Telford. Crook got their first corner in the 26th minute but the Stan were then back in control, dealing well with the occasional Crook forays into the home half, and the home side soon had another 2 shots on goal. In the 32nd minute, Rowntree had the ball in the net from a shot on the bye line but it had gone out of play first. The Stan eventually got the expected opening goal in 34 minutes when Adam Rowntree blasted a speculative shot from well outside of the box and surprised everyone, especially himself, by scoring from it. The Stan then had another 2 attempts on goal and it was not until 3 minutes before half time that Crook had another attack although Smith got down easily to stop it. The second half started with a ball from Philipson into the box to Hayton but his blasted shot saw Sinclair save well. In the 49th minute, Philipson was fouled in the visitor’s box but play continued and 2 minutes later he passed to Rowntree who passed to Hayton who blasted the ball over. The Stan kept attacking and in the 56th minute no penalty was given when there was a hand ball in the Crook box followed by Hayton miss hitting his shot. 3 minutes later and a ball in from Telford was headed wide by Hayton. In the 65th minute, another Hayton effort was stopped at the second attempt by Sinclair and was eventually followed by a Stan shot that went wide. From the start of the half, the pressure had all come from the Stan although the Crook defence had managed to deal with most of the Stan attacks. This changed in the 71st minute when Adam Rowntree, scoring his 4th goal in 2 matches, made it 2-0. He ran into the left of the box to meet the ball and, on the bye line from a very tight angle, chipped the keeper and his effort went into the far corner of the net. A minute later and Crook had their 1st effort of the half which was headed wide. Bailey then hit a shot past the post and Rowntree had an effort deflected wide. Apart from that 1 Crook effort, it was still all Stan and in the 78th minute a corner ball was missed by everyone as it went across the goal. The visiting keeper then just got to an incoming ball before Rowntree could. Crook did have an effort in the 81st minute when the ball was cleared off the Stan line and 3 minutes later Smith managed to stop another shot from the visitors. With 3 minutes to go, Burns had a shot which eventually went back out to Jones whose deflected shot was saved by the keeper. Jones then supplied Rowntree whose pass into the box was missed by Bailey. The match finished with a last rare attack by Crook. The Stan are now up to 9th, the lowest place they can now finish in the league, and end the 2015-16 campaign with 3 away matches in the next 8 days. Stan Team: Smith; McCabe; Dixon (Burns); Stoddart; Wear; Fulcher; Telford (Jones); Imray (Bailey); Rowntree; Hayton; Philipson. Unused sub: Scott. No cards issued.